Sharing borders with Chinatown, Tribeca, and the Financial District, the Civic Center is located in the heart of downtown Manhattan. Centered around City Hall Park, the Civic Center serves as the core of New York City government. With courthouses and other official buildings occupying most of this neighborhood, real estate has become more exclusive and space increasingly more limited. Residents and businesses with growing amounts of stuff continue to look for an answer to their self storage woes. That’s why Zippy Shell has decided to bring its unrivaled moving and storage service to the Civic Center! Moving and Portable Storage Delivered to Your Door in Civic Center! Do you or your company want to relocate into or out of the Civic Center in New York City? Maybe you just want to de-clutter and make some extra space around the office? No matter what your exact needs are, Zippy Shell&apos;s portable storage containers make perfect sense for a busy, dynamic spot like the Civic Center. Our unique Zippy Shell portable moving and storage units are street legal, making them perfect for navigating the busy streets and tight parking spots around the plaza. More importantly, our unique portable storage unit design allows us to deliver your moving container right in front of your address so packing and unpacking them is a breeze. Don’t want to load it yourself? Just let us know, and our team of professional NYC movers will do it for you. Moving and self storage for your home or office has never been this easy! After your Zippy Shell is loaded to your liking, our driver will pick it up and take it to our clean, climate controlled storage facility. Once it’s there, you can rest easy knowing that your belongings are being kept in a safe and secure environment. Because we are locally owned and operated, our self storage services can be flexible. Want us to hold your stuff for a few days while you transition to a new office? No problem! How about long-term storage? We do that too! When you&apos;re ready to get your portable storage unit back, just give us a call and your stuff will be delivered wherever you need it. We even offer long distance moving services. 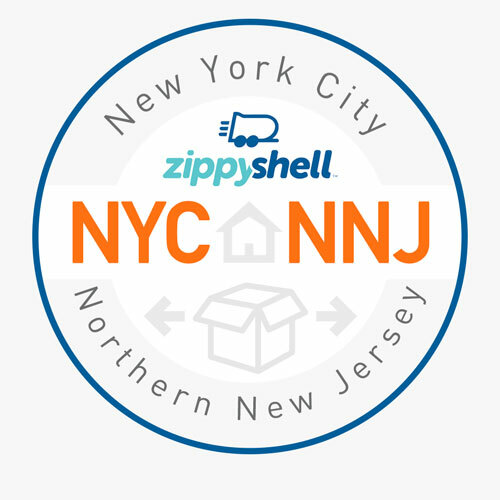 Zippy Shell moving and storage in NYC takes all the hard work and stress out of storage, so you’ll be left with more time to explore the area! Affordable Moving and Storage in Civic Center! Simply compare Zippy Shell’s pricing and unique, efficient moving and storage system to any other moving company in Manhattan. You’ll soon see why we are the fastest growing service in New York City. We promise there is simply no better solution for affordable self-storage! Contact us now to see how much money Zippy Shell can save you!